Momo's makes big pizza. I mean really outlandishly, 3 times the size of any other pizza you've ever seen giant pizzas. An Extra Large momo's pizza is 30 inches across - 700 sq inches of gooey goodness. Calzones? Also big. That's a normal size knife and fork in that pic. So size is the gimmic here, but the real trick is that the pizza is just outstanding. I said earlier that Tallahassee is not a food town. Momo's illustrates the one clear exception. Pizza here rocks. Even the very-cheap-open-late-greasy places like Hungry Howies are a step above. And places like Momo's and Decent Pizza are as good as I've had anywhere. The Momo's I ate at this evening was on Market St near Timberlane and Thomasville road. There's another, much seedier and marginally more fun location on Tennessee near campus. 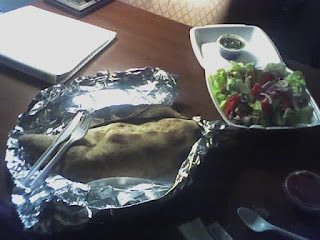 My Calzone was Artichoke, Spinach, Ricotta and Mozzarella. Out of some attempt at moderation, I only ate half the thing, though at this very moment, the remaining half beckons, wrapped in foil, sitting on the other side of the desk. The crust is thin with this tiny edge of crispness, and the cheese is perfectly proportioned. There was also a "side salad" (also huge), and a couple of little tubs of marinara. The whole deal is homemade and awesome. There's a vibe at Momo's. The staff isn't unfriendly exactly, but it's not exactly customer centric either - there's a certain cool-kid confident aloofness to the whole lot of them. They seem to be having a good time with each other - the pretty girls that work the register and the tall scruffy guys that make the pizza. To be honest, its kind of nice - the vibe works, and it all comes together effortlessly. Hanging around all those skinny college kids makes me feel really old, but that's a occupational hazard of eating all but the blandest corporate crap in Tallahassee. Actually that's not true. Skinny college kids work at the bland corporate locales as well. Youth here is inescapable. I was excited to hear about Momo's until I remembered that you're reviewing places to eat in Tallahassee. Any good places for pizza here in Austin? Hye Jon - My short list for Austin pizza: Mangia, Flying Tomato on 35th, Brick Oven (the one on 35th, not the one on Red River). In this, and only this, respect Austin trails Tally.